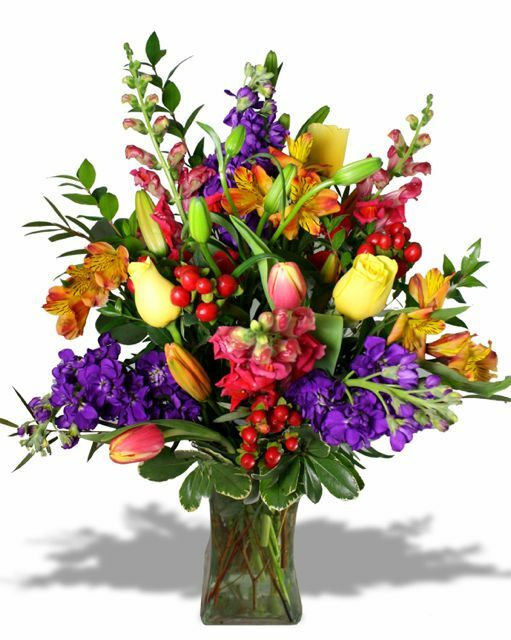 A beautiful assortment of colorful wildflowers arranged in a tall garden style vase, may include hypericum berry, lily, snapdragon, rose,tulip, stock, alstroemeria, etc. Colors and flower types may vary slightly. I ordered the Mix Berry Bunch for my mother who was retiring and she couldn't have been happier with the flowers. She even mentioned that this was one of the best flower arrangements she has ever seen which speaks volume to the care Belvedere provides. I highly recommend this great company who has been providing amazing flowers for years. They're the best! My Friend loved the Anniversary arrangement! Beautiful arrangement! My dear friends celebrated their 11th Anniversary so I had these delivered. She sent a picture of the lovely arrangement!! !Thank you. My wife said they may have been the most beautiful flowers I have ever given her. Loved this arrangement. Perfect for Mother's Day. I spoke with the receipent and she absolutely loved this arrangement. I had previously received this one myself so wanted to something special and this did the trick. Sent this bouquet for a co-worker's birthday, she loved it! Was sent to the office and got many admiring comments. Belevedere Flowers is the best!